I decided to enter the Creative Allies KISS design competition. 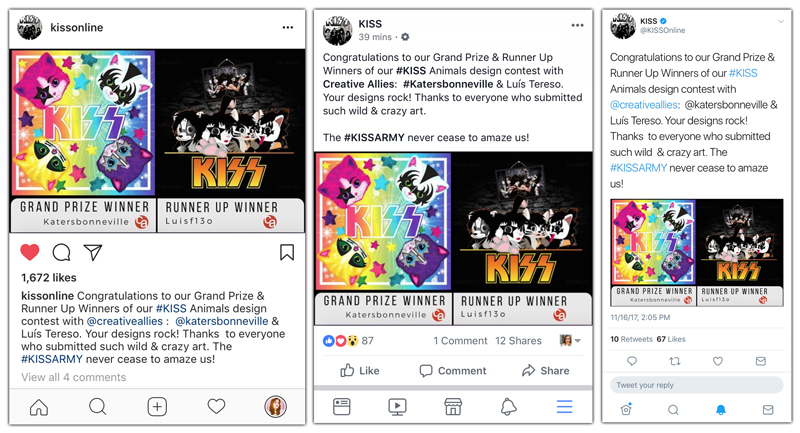 The contest asked artists to KISSify animals. I instantly thought of over-the-top animals. And there can be no more gloriously over-the-top animals than my favorite trapper-keeper design from the 90s. I am a 90s kids and I loved my trapper-keeper and I love KISS. In fact the two almost scream put me together! Because they both rock! Work in progress shot. All artwork is vector and made in illustrator. Here is the final work. It has so much humor I just frickin' love it! Oh my goodness I actually won the competition! I had no idea that would happen! CLICK HERE to see all the entries. I am so happy the band appreciated the whimsy I put into this project. And how adorable are these little cuties? Get your cuties a KISS shirt HERE. Your Christmas wish list is above. I also got a couple of shout outs on social media from the band. And some love in an email sent out by Creative Allies sighting that there were over 200 entries in this competition! They shared my work on Instagram, Facebook, and Twitter. So awesome to know there were over 200 entries! Creative Allies also features an interview with me that you can read HERE. And the biggest take away I have from this experience is if you have to just keep making work and keep sharing it. The only reason I won was because I entered and because I have spent years becoming the designer I am today. So let the below image be your take away for the day. Trust me I drew lots of kitties in the last 10 years.